Green tea shortbread with raspberry sugar. This year is no exception. Behold, my happy, glorious green tea cookies, made in a shortbread style, with lashings of matcha powder and raspberry sugar for that festive appearance. Did I also mention that they are delicious? The earthy, mellow bitterness of matcha, the sweet crunch of sugar on top with just a hint of salt, the buttery texture that crumbles and melts in the mouth. I made this green tea shortbread a few months ago, for a friend's party, and I was so filled with joy when I got not one, not two, but three expressions of interest for the recipe, even from those who don't normally bake. To these lovely people I apologise, as I have only now posted this recipe, after finally trying it again to make sure it works properly. Better late than never, eh? Naturally colourful green tea cookies for Christmas! Or anytime, really. Mix flour, matcha and salt in a bowl. Set aside. Vigorously beat butter and sugar together till they combine and take on a lighter, fluffier appearance. (If, like me, you take the manual approach and beat it by hand with a wooden spoon, feel free to sing "Beat It" for additional entertainment.) Add egg yolk, and gently beat again until mixed together. Add the flour mix. Start off kneading it with the wooden spoon, but eventually move on to using your hands. It'll be quite a moist dough. Lovingly roll the dough into cylinders / logs of about 3.5cm (1.4 inch) diameter. Due to the fragility of the dough, I made 4 logs, as smaller logs are less likely to break. Carefully wrap the dough logs with plastic wrap, and place in the freezer for 30 minutes. Once the dough has done its time, retrieve from the freezer. Slice the logs into rounds of about 0.6cm (1/4 inch) thickness, and place on a tray lined with baking paper or foil. Pre-heat the oven to 140°C / 285°F fan-forced (160°C / 320°F conventional). If you would like to decorate your cookies as I have, brush the surface with a thin layer of egg white. Then scatter each piece of shortbread with just a few grains of fancy salt, if using (I allocated 3 - 5 grains of vanilla salt for each piece), and then a more generous sprinkling of raspberry sugar, or whatever pretty sugar you want to use. I bought my raspberry sugar, but you could perhaps try making your own, by rubbing a bit of raspberry juice through some sugar. Place the tray of shortbread into the oven and let it bake for 16 - 18 minutes. Note - matcha (green tea powder) can vary in their potency. 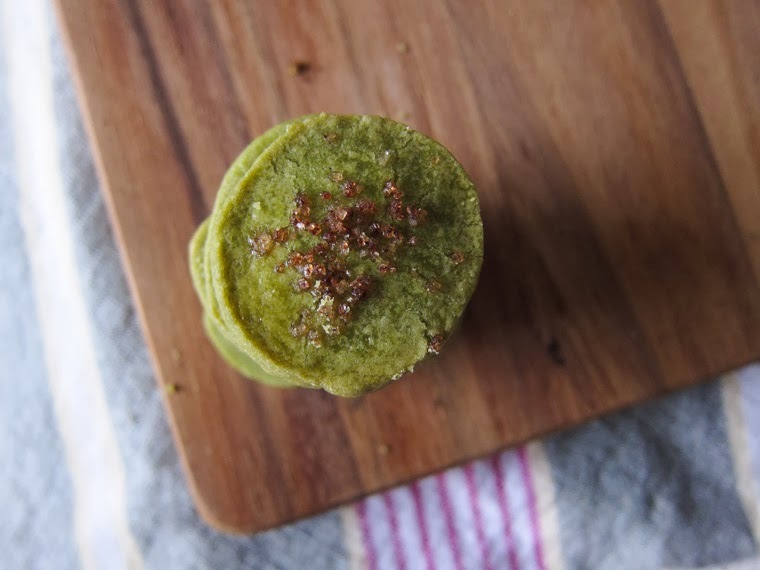 I've found that with a strong matcha, 6-7 grams / 4 teaspoons can be sufficient for this recipe, while a weak one will require 9-10 grams / 6 teaspoons. 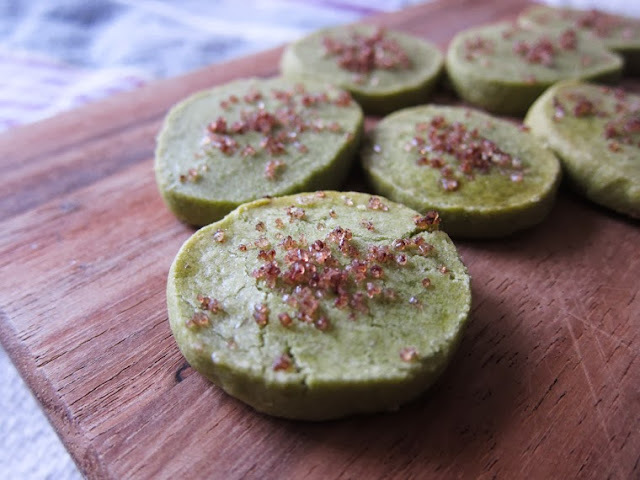 Therefore, unless you're already very familiar with your matcha and how much to use in recipes, I suggest trying this shortbread recipe with the recommended 8 grams / 5 teaspoons to start with, and with subsequent batches you can fine-tune your ideal amount. A close-up cross-section shot of the green tea matcha shortbread cookie. EEEEEE! These look awesome! I'm made it a goal in life to eat as much shortbread as I can, and hot dayum do these look fantastic. And raspberry sugar... there's something I've never heard of before:) Happy holidays! How pretty! I love the raspberry sugar it makes it perfect for the holidays! This sounds like a wonderful combination - and how awesome does the raspberry sugar sound! That is an interesting combination that sounds lovely, plus the raspberry red and matcha green are perfect for the holiday season! Yeah, can't go wrong with that colour combination! These look so pretty. 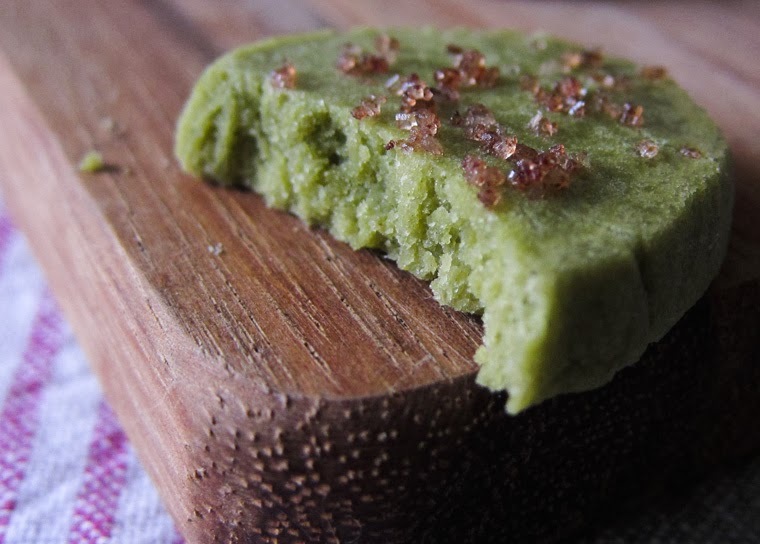 I've made matcha shortbread before, but I love the raspberry sugar! I've made matcha shortbread a few times and love it, but raspberry sugar is a new one on me. It looks fabulous on top of your matcha biscuits - lovely colour combination.